For the victims of Japanese atrocities in 1945 in Batangas, in the aftermath all the survivors could really do was to bury their deceased loved ones, often in shallow graves close to their homes. 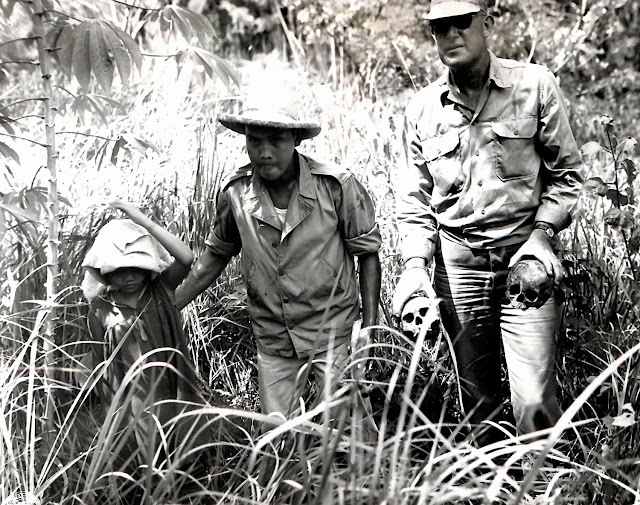 The photograph above shows a survivor with likely an investigator from the United States Army after having dug up skulls from a shallow grave. Original Caption: A member of the U.S. Army exhibits two skulls, at the grave of Mrs. Dimaano, as members of her family look on. These atrocities were caused by the Japs, during the war. Lipa, Batangas, Luzon, P.I. (for Philippine Islands).